A woman. A man. A boy. Woman gets lost. Man goes looking for her. Boy goes looking for man. Strange, enchanted, and forbidden place where only the man has been before...when he was a boy. Talking human sized rabbit-like creatures who consider the man to be a LEGEND. They are at war. They have an agenda of their own. Other large creatures. Who are the good guys? Who are the bad? Will the man ever find the woman? Will the boy ever find the man? Will they be eaten alive? Will they become slaves? Who will win the war? Who really are the good guys? This is extremely well written. The story is intense, yet suitable and probably within the grasps of most children too. It pulls you in and doesn't let you go. Scary. Yet cute. Far-fetched. Yet somehow very close to home. You won't be able to put it down. And when you're through...well...you'll see. I very highly recommend this for ALL ages. "Working on this book with Julie was a pleasure from the first page. With the first book in the The Secrets of the Home Wood series, she’s constructed a Chronicles of Narnia-like fantasy world with talking beasts, epic battles, and danger looming at every turn. Young readers will find themselves side-by-side with boy hero Jonathon James as he embarks on the quest of his lifetime: to find his parents. 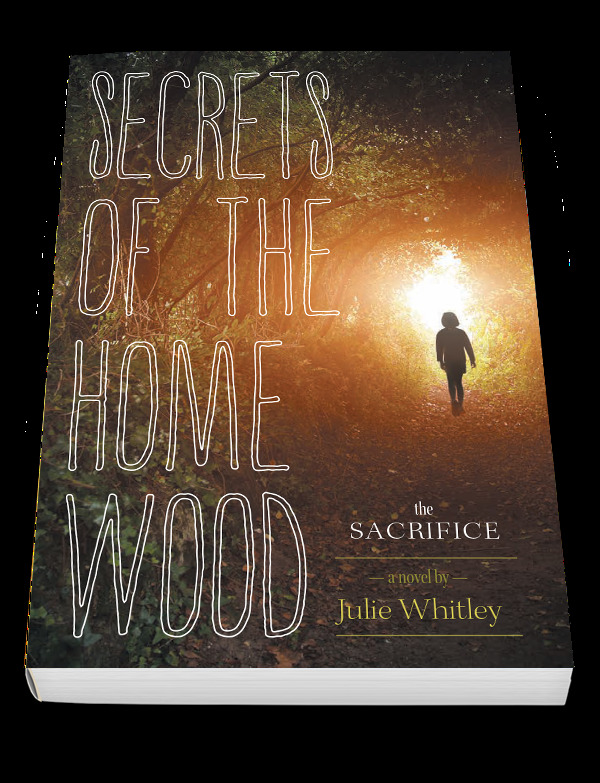 A rich and imaginative new series, The Secrets of the Home Wood: The Sacrifice is a thrilling family saga at heart. Leave the Home Wood behind and step through the portal to join an adventure for the ages." — Valentina D'Aliesio, freelance editor. Julie Whitley’s Secrets of the Home Wood is a brilliantly imaged tale of fantasy and magic, framed in a tale of family that will gain the reader’s sympathy from the first line. Jonathon James’s adventures are coloured by his drive to find his father, and they will take him from the hidden homeplace of the San to the craggy fortress of the Maorrr in search of his father, his mother, and his answers. Whether it’s giant ants, breaking into a castle via the sewers, or rescuing a kingdom’s only heir, Jon’s courage and his determination to see his family reunited are the unifying thread of the action. This is a beautiful story of hope in the face of impossible odds that is guaranteed to keep readers of all ages turning the pages well past curfew. The James family holds a dangerous secret. The forest behind their home is not normal. It holds a mysterious portal to another world. Although entering the 'home wood' is forbidden by his Grandfather, one day Jonathan crosses the creek into the treelike after watching his father disappear into the woods. His mother Sarah is sucked in too, and soon the three of them are launched on a quest to find each other in a dangerous new world on the eve of war. The three factions have coexisted in harmony since the first time Jonathan's father, David, came though the portal as a child. He ended the first war, and is now a legend. As the most brutal faction of the three faces a coup, Jonathan, David, and Sarah join forces with the Snugg family. Separated by conflict, the Snuggs struggle to find each other as well. Secrets of the Home Wood is a whimsical fantasy adventure with a new surprise on every page. The suspense and twists are never ending, and Whitley does an excellent job encapsulating the politics and repercussions of war in a well-crafted debut. Secrets of the Home Wood is high on my recommendation list - five stars for sure. I really enjoyed Jonathon's curiosity and bold willingness to set out on an adventure. When a young boys father heads into the woods in search of his distraught wife, his son takes pursuit. Once in the home wood, he discovers a whole new world. Each on separate journeys towards each other, they'll make friends, fight foes and ultimately find their way back to each other. It's hard to pin point the type of story this is because there are so many plot lines (in a good way, meaning the story was complex), but for me it was both a coming of age story and a love story. I'm not the target audience for this book, since I don't really read fantasies, but I really enjoyed Jonathon's curiosity and bold willingness to set out on an adventure. I also was enamored by the world the author created beyond one family's backyard. It was quite impressive! I would recommend this book to pre-teen boys, and girls who don't mind getting their hands dirty.